Comedian George Carlin appears at Wheeler Opera House in Aspen, Colo., in 2007 during HBO's 13th Annual U.S. Comedy Arts Festival. 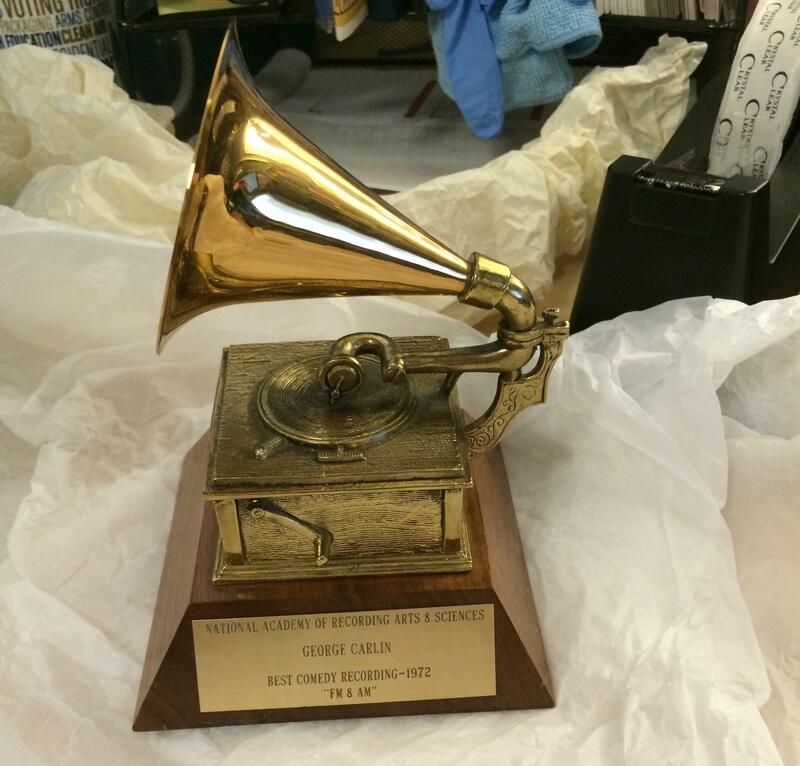 This award for Best Comedy Recording from the National Academy of Recording Arts & Sciences in 1972 is among the items in George Carlin's archives. 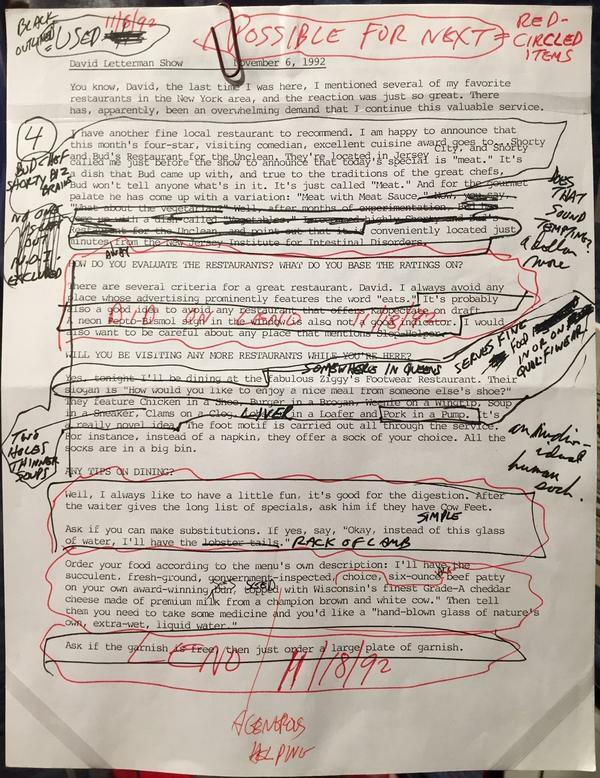 George Carlin's marked-up script for a 1992 appearance on the Late Show With David Letterman. It's one of his most famous routines and, like all great comedy, contains more than a grain of truth. Since he died eight years ago, the keeper of George Carlin's "stuff" has been his daughter, writer and performer Kelly Carlin. She says he kept everything: Scrapbooks. Arrest records. The pink slip to his first car, a Dodge Dart. VHS tapes. From "handwritten notes of his actual working on comedy ideas to his kind of OCD-esque way of making lists of things, like every routine he ever did on a late night show," she says. "When comedians would come over to my house and I would say, 'Do you want to take a glance at my dad's stuff?' Their eyes would light up. I knew how to get to their hearts immediately," she says, laughing. George Carlin remains one of the most influential stand-up comedians of all time. At a private event Tuesday night in New York, his daughter announced she's donating his archives to the National Comedy Center, which is expected to open next year in Jamestown, N.Y. This is The National Comedy Center's first, major donation, says chief curator Kliph Nesteroff. They're thrilled. "George Carlin had the eternal respect of every person in stand-up and still does," says Nesteroff, who wrote the book The Comedians. "George Carlin, more so than probably any other major comedian you could name, was a complete historian of his own career." In addition to a permanent exhibit of Carlin's "stuff," Nesteroff says there are plans to create holograms of the giants of American comedy. 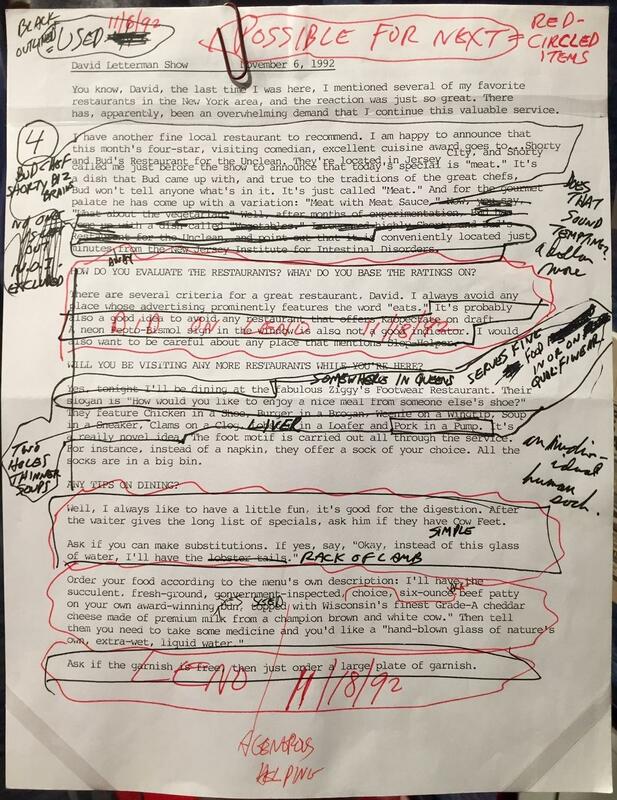 One of the many artifacts that will make Carlin aficionados' eyes pop is a script he typed up for an appearance on the Late Show With David Letterman. Hand-written notes are scribbled in the margins. Lines are crossed out, with "Did on Leno" scrawled across them. The words to one joke are changed, from "lobster tails" to "rack of lamb." The archives also include unreleased material, like this bit from a show in 2000 about government department names that don't make sense. Kelly Carlin says she had "fantasies" of her dad's archives going to the Smithsonian but decided against even trying because she feared his "stuff" would end up in a vault somewhere. "Y'know like that last scene of Raiders of the Lost Ark where the Ark of the Covenant just goes into a warehouse somewhere," Carlin laughs. "I mean, bless them, but I pictured my dad's stuff just going into an archive and not being seen by anyone." She adds that George Carlin's archives are a different kind of attraction. "It's not Archie Bunker's chair or Judy Garland's shoes from The Wizard of Oz. I wanted his stuff to be experienced by comedy nerds and comedy fans and to be really appreciated," she says. To experience Carlin's meticulously archived "stuff" from some 50 years in comedy, fans will need to make the pilgrimage to far western New York. Jamestown is a city dedicated to comedy. It's Lucille Ball's hometown and home to an annual comedy festival, now in its 25th year. Jamestown, N.Y. will soon be getting some very valuable stuff that belonged to the late comedian George Carlin. He remains, of course, one of the most influential stand-up comedians of all time. And last night, his daughter, Kelly Carlin, announced she's donating his archives to the National Comedy Center, which opens next year in Jamestown. NPR's Elizabeth Blair has that story. ELIZABETH BLAIR, BYLINE: Ah, the insights of George Carlin. Listen to what he says about our stuff. CARLIN: ...Trying to find a place to keep your stuff. CARLIN: That's all your house is. Think of it. That's all your house is. It's a place to keep your stuff. KELLY CARLIN: Handwritten notes of his actual working on comedy ideas to his kind of OCD-esque (ph) of making lists of things, like every routine he ever did on a late night show. BLAIR: One artifact is a script he typed up for an appearance on "David Letterman." Handwritten notes are scribbled in the margins. Lines are crossed out with, did on "Leno," scrawled across. The words to one joke are changed from, lobster tails to, rack of lamb. The archives also include unreleased material. CARLIN: Well, I was raised Catholic, and I'm still waiting for a new pope to choose the name Corky. CARLIN: Wouldn't that be fun? His Holiness Pope Corky IX. CARLIN: Well, I think you'll have to skip right to nine to give him a little bit credibility, don't you? Somehow to me, Pope Corky I doesn't command a great deal of authority. KLIPH NESTEROFF: George Carlin had the eternal respect of every person in stand-up and still does. He's one of the most influential comedians of all time. BLAIR: Kliph Nesteroff is the author of the book "The Comedians" and chief curator at the National Comedy Center. The museum is slated to open next year. Nesteroff says this is its first major donation, and it's significant. NESTEROFF: George Carlin, more so probably than any other major comedian you could name, was a complete historian of his own career. BLAIR: Kelly Carlin says she had fantasies of her dad's archives going to the Smithsonian. But then she feared his stuff would end up in a vault somewhere. CARLIN: I wanted my dad to be a star. My dad liked to be the star. You know, I mean, he was a humble man. But he also knew that he had a place. And I wanted his place in comedy to be really honored that way. BLAIR: To experience Carlin's meticulous archives of some 50 years in comedy, fans will need to make the pilgrimage to far western New York. Jamestown is a city dedicated to comedy. It's Lucille Ball's hometown and home to an annual comedy festival, now in its 25th year. Elizabeth Blair, NPR News. CARLIN: Not just because they help me professionally. CARLIN: It's also my hobby. You see, I'm an entropy fan. When I first heard of entropy in high school science, I was attracted to it immediately. When they told me that in nature, all systems are breaking down, I thought, what a good thing. What a good thing, perhaps I can make some small contribution in this area myself. Transcript provided by NPR, Copyright NPR.